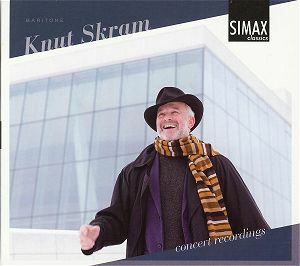 When Knut Skram was twenty he went to America to be a cowboy on his uncle’s ranch for a year, After being thrown from his horse he gave up his cowboy dreams and went to the Montana State University School of Architecture. In 1963 he had his Bachelor of Architecture Degree – his diploma thesis was, suitably enough, entitled "An Opera House". He came from a musical family – his father, who was a priest, played the violin and his mother the piano. He had been singing since he was a little boy, at home and eventually in a choir, where he also was soloist. While in America music really took a hold on him and he studied voice in parallel with architecture. The first opera he ever saw was Menotti’s Amahl and the Night Visitors, and then took part in the performance himself! He worked for six months with a firm of architects in the US before he went back to Norway. There he gave himself two years to se if he could earn his living as a singer. He could. He made his debut with the Norwegian National Opera in 1964, where he remained for 36 years, singing more than 50 major parts. But he soon got invitations from abroad and became a much sought-after guest all over the world except Australia, However he did sing opposite Joan Sutherland in I Puritani at a concert performance in Stockholm, which I still have fresh in the memory. On this disc we hear him in live recordings spanning almost 25 years and it is a good testimony to his consistency over the years. On the most recent recording, Wolfram’s Song to the Evening Star from Tannhäuser, he has developed a wider vibrato on sustained notes. There is a little more strain and the tone is slightly drier. But even during his earliest years his tone wasn’t particularly sappy. What first and foremost made him stand out was his superb articulation, his identification with his role characters, his sense of style and his willingness to scale down the volume. At pianissimo he produced soft beautiful tones and a perfect legato. In the long scene from the second act of La traviata he gives ample proof of all these characteristics, inspired no doubt also by the sensitive and involved Violetta of the late lamented Inga Nielsen. There are few more moving readings in my vast collection and Skram’s development from stern brutality to sympathy is well portrayed. The end of the scene is extremely beautifully sung by both artists. Unfortunately there is applause in the middle, and at the end some heavy distortion. This scene was also included in the Chandos 2-CD set with Inga Nielsen, issued last autumn (see review). The earliest recording, Renato’s hateful Eri tu from Un ballo in maschera, is from the finale of an international competition in Helsinki. We can hear his wrath against the former friend in the recitative while in the aria proper his long legato phrases are splendid. The aria from La forza del destino finds him in even finer form with a commanding presence on a par with the best of his contemporaries. His Rigoletto is also deeply felt. Early in his career he had great success as a Mozart singer. The two arias included here were recorded much later and hardly representative of when he was at his prime. The Champagne in Don Giovanni’s aria is a bit stale and Papageno is more middle-aged than he needs to be, but there is some virtuoso whistling at the end that saves the day. On the second half of the disc we encounter the recitalist. Skram is accompanied by the excellent Robert Levin, whose sensitive phrasing and touch can be admired all through Dichterliebe, especially in the postlude to Die alten, bösen Lieder. As for Skram’s reading of the songs I am in two minds. These are obviously deeply considered interpretations. There are in every song many fine details and a lot of beautiful and sensitive soft singing. But very often he drags and there is too often a lack of momentum. Of the recordings I have in my collection this is the slowest. Tom Krause on a Finlandia disc is even slower in some songs but he has more energy. I imagine that closer acquaintance with this reading may give new insights and many songs are almost hypnotic – and as always Skram’s care over words is prominent. Whatever one’s reaction to this and that on the disc it is a worthy tribute to this eminent singer, who actually is still singing – albeit not too frequently. When he was at his busiest he found that he had been abroad for 207 days in one year, and then he decided to cut down – which wasn’t too difficult since his wife had hidden his passport!